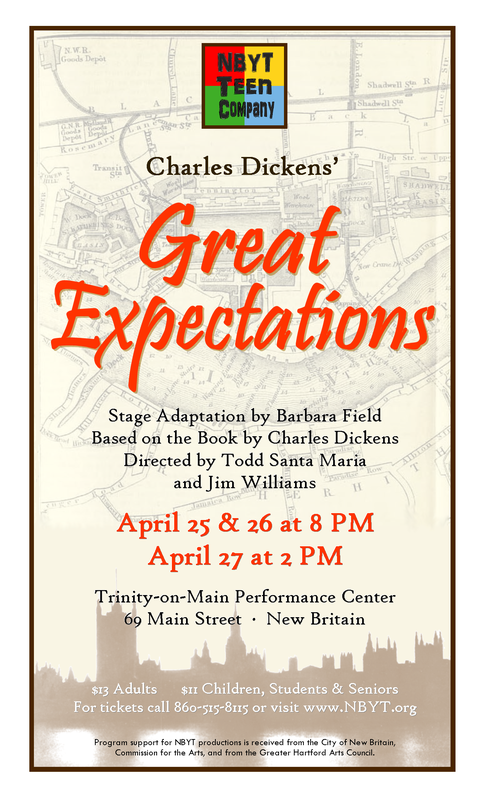 The NBYT Teen Company will perform a stage adaptation of Charles Dickens’ Great Expectations on April 25, 26 and 27, 2014, at Trinity-on-Main Performance Center. Great Expectations, adapted by Barbara Field, is a large-cast adaptation closely based on Dickens’ classic novel about young orphan Pip who rises from being a blacksmith’s apprentice to a London gentleman, but learns in the end that nothing was as he thought it would be. Dickens’ gallery of characters from rogues and prisoners to the privileged but flawed are all portrayed. The production is directed by Todd Santa Maria and Jim Williams. Great Expectations stars young actors ages 8 through 20 and is appropriate for audiences of all ages. (The youngest cast members play young Pip and Estella and other child roles.) The cast of twenty-four has come together from New Britain, Avon, Berlin, Bloomfield, Bristol, Glastonbury, Middletown, Newington, Plainville, Southington, and Wolcott. Great Expectations will be performed at Trinity-on-Main Performance Center, located at 69 Main Street in downtown New Britain. Performances are Friday, April 25, at 8:00 p.m.; Saturday, April 26, at 8:00 p.m.; and Sunday, April 27 at 2 p.m. Ticket prices are $13 for adults and $11 for children, students, and seniors. Tickets may be reserved by calling New Britain Youth Theater at 860-515-8115 or may be purchased online at Brown Paper Tickets. The NBYT Teen Company is a program of New Britain Youth Theater in which teens become involved in helping to choose, produce and promote their own theater. The program offers leadership opportunities and a chance for teens to suggest the shows they want to do, all while under the guidance of NBYT directors. Previous Previous post: Come with NBYT “INTO THE WOODS” this Summer! Next Next post: Take a peek at GREATness!